Anne Elliot is to be pitied. It's not just that her father and eldest sister are vain foolish creatures who care only for rank and money it's that these traits led them to convince Anne to break her engagement to Commander Frederick Wentworth, thinking he would amount to nothing. Seven years later there is finally peace, though not in Anne's heart. She still loves Frederick Wentworth, now a Captain and a wealthy man. Yet she knows she will never be lucky enough to get a second chance to be his wife. Instead she is to move with her family to Bath. They have been forced to give up their ancestral seat of Kellynch Hall due to their straitened circumstances. And in a twist of fate their home is to be let to Captain Wentworth's sister and brother-in-law. What's more Anne is to spend some time with her younger sister Mary at Uppercross, a mere three miles from Kellynch Hall, delaying the painful separation from home and yet seeing it in the hands of strangers who might have become Anne's family! Mary married Charles Musgrove, whom initially paid court to Anne, whom Charles's two sisters, Henrietta and Louisa, would have rather their brother had married. It's Henrietta and Louisa who become the center of the social life around Uppercross as Captain Wentworth visits his sister and decides that one of these two fine ladies will become his wife. Not only has Anne lost the love of her life but she must now watch him court another, her own bloom faded. Though the course of love is never smooth, Louisa meets with a tragic accident which tears at the soul of Captain Wentworth while Anne meets her father's heir, her cousin Mr. Elliot, who sets his sights on Anne's heart, a heart that is receptive to his advances at first. Can Anne find love again after so many years being thwarted? And who will win her heart? The old flame or the new? For certain reasons Persuasion is the one book by Austen I'm least likely to turn to when needing an Austen fix. This has nothing to do with the book itself and everything to do with the 1995 adaptation. While for most adaptations I'm able to appreciate them to varying extents and then leave them behind, I just can't with Persuasion. To me the adaptation and the book are one. I find this ridiculous. I really don't know where this came from. When I re-read Pride and Prejudice I don't always see Colin Firth! He might be the best Mr. Darcy but depending on my mood Mr. Darcy could be any number of very good Darcys out there. Yet Captain Wentworth is Ciarán Hinds and Anne Elliot is Amanda Root and Mr. Elliot is Samuel West. And here's the thing; I HATE them all in this adaptation. It's not that they're wrong for the roles per se, it's just that my mind actually revolts at this casting, or maybe it's the directing, I just can't. Amanda Root with that emotionless placidity and those horribly high collared dresses, Samuel West with his smarm, and Ciarán Hinds? Just all the no. Now this isn't like my seething hatred of the 1999 adaptation of Mansfield Park, because nothing will ever match that, this is just the actors entering my subconscious and making the book less than. Because the book is brilliant and if I could just somehow succeed at untangling the two it seriously would better my literary life and I would be ever so grateful for purifying my love of Austen. Perhaps intense therapy by watching the 2007 version over and over again might help? Yet the irony of it all is that unlike Frances O'Connor I actually really like the three leads. In other things obviously. In fact I quite admire Ciarán Hinds, just never as a romantic lead. As for Samuel West? He really has grown on me over the years, plus if I ever get annoyed with him I can just watch him getting killed in Howards End and we're all good. As for Amanda Root she redeemed herself with The Forsyte Saga. Now if only I could have the book be the book and the movie be the movie! I will say I succeeded far better this time around at trying to make this separation a reality. "Forcing" myself to think of Rupert Penry-Jones was very helpful. But more than that it's how having re-read Austen's entire oeuvre in such quick succession I was struck by how mature her writing had become and all other issues faded away. This makes it all the more heartbreaking that she died so young seeing what her writing could have evolved into. Her six books are all classics, but with Persuasion we see Austen at the top of her game. She's a more confident writer, willing to take narrative risks and in the end creating what I think is her most approachable book for modern readers. Where this really shines is in the almost stream of conscious panicked flow of her thoughts when she encounters Captain Wentworth again for the first time. Even if Andrew Davies in his introduction hadn't pointed this observation out to me I know I would have latched onto it and other moments like it. There's something about these sections that pulse with life. It captures to an extent not just how you think when under pressure but it's almost as if Austen has perfectly captured what it's like to be in the midst of a panic attack. The whooshing of time and thoughts, the way time expands and contracts, the rushed half composed thoughts just pushing against you: [A] thousand feelings rushed on Anne, of which this was the most consoling, that it would soon be over. And it was soon over. In two minutes after Charles's preparation, the others appeared; they were in the drawing-room. Her eye half met Captain Wentworth's, a bow, a curtsey passed; she heard his voice; he talked to Mary, said all that was right, said something to the Miss Musgroves, enough to mark an easy footing; the room seemed full, full of persons and voices, but a few minutes ended it. Charles shewed himself at the window, all was ready, their visitor had bowed and was gone, the Miss Musgroves were gone too, suddenly resolving to walk to the end of the village with the sportsmen: the room was cleared, and Anne might finish her breakfast as she could. Who couldn't feel for Anne in that moment? The crush and press of all those people in the room and knowing that "the one" was among them. Much like Mansfield Park we, as readers, are in an interesting position having not been there for the courtship of our hero and heroine. "The One" has already been found and the love is already there. But here it's more unique in that it was lost. Anne is a different kind of heroine to any of Austen's previous heroines. She found love at a young age but was dissuaded and therefore lost the love of her life. Unlike Darcy who is rejected by Elizabeth their love wasn't cemented so a similarity of situations doesn't exist. All Austen's heroines have at some time thought they have lost the love of their lives but unlike Anne they haven't had to wait almost a decade for a happily ever after. If you start to lose hope after a few months, imagine the pain bearing this weight year after year? She lost everything to care for her family, to tend to the duty due to the Elliot name and yet by some miracle she is given a second chance. She is past her prime, as can not be said enough by Austen as she tells of the faded bloom that Anne once possessed, and yet there is hope from the ashes. She regains her beauty as she regains the belief that Captain Wentworth hasn't forsaken her. Their love is just as strong if not stronger. It has endured. And while I begrudge the 1995 adaptation I do agree with it's tagline as "A Fairy Tale for Adults." This isn't about finding perfect happiness as a young teenager, this is about love enduring, how even when you're at the age when society has written you off as being hopeless with regards to finding a mate it can still happen. 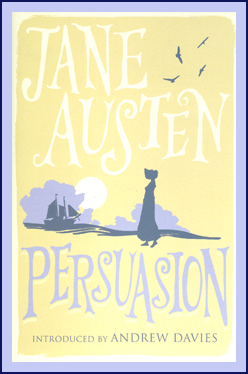 Seeing as I'm not the teenager I was when I first picked up Persuasion being told that it can still happen is a magical message indeed. I will of course ignore the fact that they met while teenagers and that Anne's older sister named Elizabeth is probably on the shelf forever. See, I can delude myself in some regards! With Austen's more mature authorial voice she's also willing to tackle more "real world" problems. She began this in Mansfield Park by actually deigning to talk about the war and here she continues that and compounds it with depictions of licentiousness, poverty, and illness. So while she might still rush her endings she is braver in depicting the larger world around her through the filter of the drawing room instead of having anything untoward happen off book and open to interpretation. Which brings me to the Musgroves. While one could make fun of the Musgroves as being a family that tends to fall and injure themselves, a lot, I see this as just a vehicle in which Austen is showing the precarious nature of health in that day and age. At this time in her life Jane was probably thinking quite a lot on life and death as she was slowly dying herself. Unlike in other books where deaths are just backstory here they're more present, more real. Death is the end of any story, happy or otherwise. Maybe it's just the fact that health care is constantly in the news that this aspect of Persuasion struck me so forcibly, but life was precarious. Life is still precarious. Yes, we have had amazing advancements in medical care but there is still suffering, there is still lack of access, there are still people like Anne's friend Mrs. Smith! Poor and in pain and trying to reclaim some of their lives. And Mrs. Smith is herself an interesting character. How exactly are we meant to deal with her? She was Anne's equal now fallen on hard times. Therefore she deserves our pity. And yet... This and yet is because she withholds key information from Anne and only decides to tell her when she thinks it will bring herself gain. This is all water under the bridge and Mrs. Smith is congratulated as helping reunite the happy couple and she gets the help she needed. But she got it in such a scheming way that I still don't know what to make of her. And here is the power of Austen. Complex characters that make us think. I might in the end not like Mrs. Smith, but I pity her and admire her balls. The characters though I can never admire on any level are Anne's father and her eldest sister Elizabeth. Sir Walter and Elizabeth are perhaps the most self-centered vainglorious characters Austen has ever written. And the thing is, I don't think she wrote them as comedic relief, no matter how hard you laughed when hearing how many mirrors Sir Walter had in his dressing room or how he will only observe people under natural light. I believe that she wrote them to be a social commentary on Bath. If you've read anything about Austen's life you know she lived in Bath for a time and that she hated every moment of it. In Northanger Abbey we get a taste of Bath life but all the characters are passing through. They've only made Bath their temporary destination. They are tourists, nothing more, and it's not these people that Austen seeks to lambaste. It's those who have chosen Bath as their permanent residence. Whether she's commenting on the town because of the type of people it draws or on the people themselves, one thing is certain, as Austen has written Anne's family they are true denizens of Bath. When Kellynch has to be given up Bath is the obvious choice, for personality type more than for financial straits. Here Sir Walter and Elizabeth can glory at all the people who want to be near them and they in turn can fawn over their Dalrymple cousins. It's a symbiotic relationship of people who are leeches in a town that leeches your will to life. It's no wonder Anne hates the town so much, who wants to be around a swarm of self-centered assess who long to be trendsetters whom everyone follows? No thank you. As for the whole "Anne losing her bloom" perhaps it was a combination of Bath coupled with the lose of Captain Wentworth. Bath sucked Austen's will to write and it was her fallow period, therefore it's no wonder when reclaiming her voice she decided to shout to the rooftops her hatred of the Roman town.